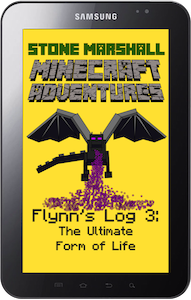 Flynn's Log 3 is on pre-order for Google Play/Google books! Available September 18, 2014. Things get heavy in Flynn's Log 3. Flynn's quest to fulfill his destiny continues. He becomes arrogant with his new ultra digital powers, and with arrogance comes weakness. Flynn will clash with Endermen and go face to face with the Ender dragon, as he journeys through Minecraft with his friends, Zana and Simon. But will Flynn prevail? Will Flynn accept his digital life inside Minecraft or battle to rejoin the physical world? Find out in the third Stone Marshall Minecraft Adventures, Flynn's Log 3: The Ultimate Form of Life. Each log entry ends with a unique illustration depicting the events that occurred in the previous section.